Yes you read correctly! We will be having Corner Grass LIVE on the internet with our Feed! The Main events are Saturday June 25 at 10AM MST. The feed will be on and off depending on service, however you will get to see some crashes happan LIVE!!! Visit www.SecondGearClub.com for event info! We were a bit disappointed that the Saskatchewan cellphone towers were a little bit difficult, however we did get to broadcast some live trials! 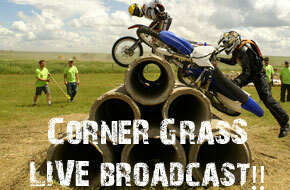 With this in mind, the SGC is going to Broadcast once more at the Edson Harescramble! We are extremely excited with this new medium of sharing our events with our racers, fans and the world! Its amazing what technology can allow a small non-profit motorcycle club to do!